The picture above has not been photoshopped. 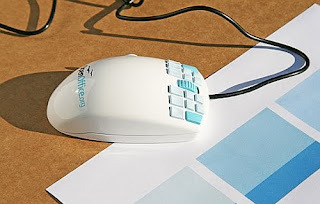 This is an 18 button mouse. That's right eighteen buttons!!! Now besides the fact that it's funny, let's take a look at this from another angle. Hopefully I can help developers learn something from this. It's a frequent occurrence in technology that it would be "really cool if our product did..."
However, you have have to stop and think of "why is it a good idea" and "who would use this new idea". I frequently see or advise on products that have what the developers/engineers think are good ideas, but unfortunately they are the only ones who think that way. It's important to design with the end in mind. In dentistry, we're trained to envision the end process and then work toward that goal. I've seen devices and software (like the mouse here) that are made incredibly complicated to use because developers thought that having every option available would be good thing. Keep in mind that most users only use 20% of features in a given program! It's much more important to provide a quality experience than to provide an avalanche of features. Sometimes less really is more. In a very short amount of time, the mouse above will be in bargain bins and then a few years from now it will be in some article with the "remember when" slant. I don't care that the buttons are fully programmable; this is a bad product no matter how much lipstick you put on it.